I’m a big fan of garlic! I put it in every dish, any chance I get. I use garlic cloves, minced garlic, garlic powder, garlic salt, and now, thanks to Lia Marie’s, I can add garlic butter to my arsenal! Keep reading for a delicious chicken recipe! 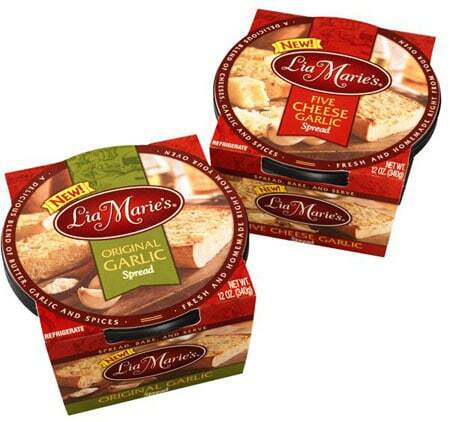 Lia Marie’s is a revolutionary new garlic spread that allows you to enjoy the incomparable taste of fresh, homemade garlic bread anytime, prepared just the way you like it! 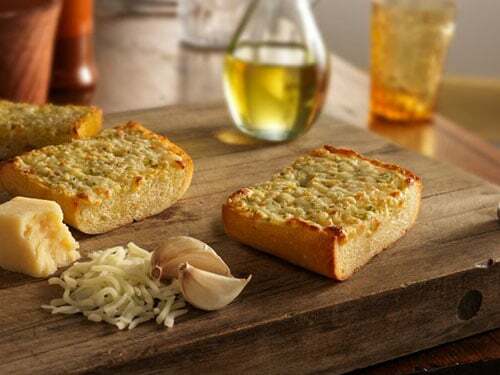 With it’s unique blend of roasted garlic, natural cheeses, butter, oil and savory seasonings you can experience, not only mouth-watering bread bursting with flavor, but this spread goes way beyond the bread! Over the next few months, I plan to share a variety of dishes you can serve your family using either of the two varieties of Lia Marie’s spread! From bread, to salad, to pasta and chicken, you’ll wonder how you ever cooked with out it! Of course, Lia Marie’s spread is perfect on your favorite bread to serve along side any meal. The first night we tried it was on a loaf of french bread with our spaghetti dinner and it was a big hit! The four of us polished off the entire loaf of bread with dinner that night! I knew next I would like to try it with chicken. It was really simple and really delicious! I think my husband told me at least four times at dinner that night how much he liked it – no joking! lol It was actually a very simple ‘recipe’ but the Lia Marie’s just kicked it up a notch! It’s so simple, I hesitate to call it a recipe, but here you go so you don’t have to write it down. 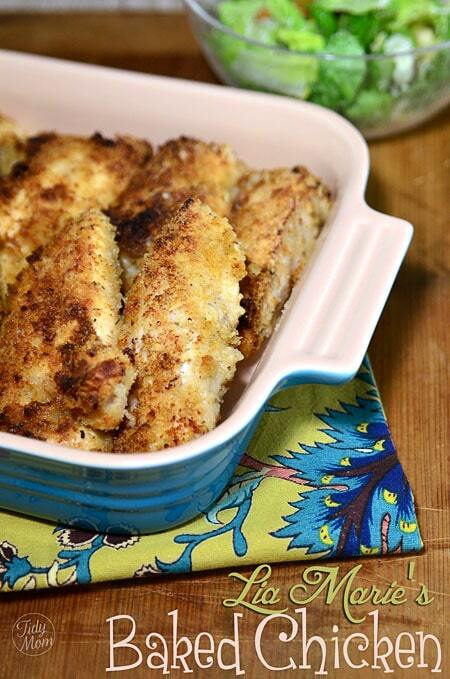 A delicious twist to breaded chicken breasts. Line baking sheet with tin foil and give it a good coat of no-stick spray. Mix bread crumbs and salt in shallow bowl or plate, and set aside. Cut chicken breasts into tenderloin strips (I got 2-3 tenderloins out of each breast), pat dry. Spread Lia Marie's Garlic Spread on both sides of chicken. Bake in 375° oven for 30 minutes, then turn oven to broil and continue baking for 5-8 minutes or until coating is a light brown. If you are not able to find Lia Marie's Garlic Spread in your area, you can substitute using real butter with crushed garlic or garlic powder. Please note that right now Lia Marie’s is only available in St. Louis, San Antonio, Austin, Green Bay and Milwaukee, but they are working hard to get into new territories! 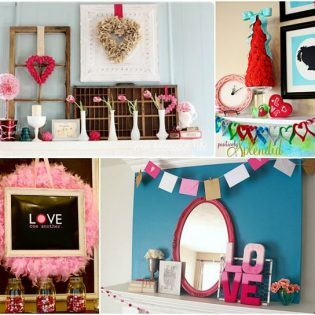 So let your grocer know you’d LOVE to see Lia Marie’s in your store! Where to find Lia Marie’s, the garlic spread that’s sweeping the nation. Lia Marie’s is available in 12-ounce tubs and can be found in the refrigerator section where butter is sold. Be sure to grab a coupon good for $1.00 off over at the Lia Marie’s Facebook page, and let them know TidyMom sent you!! If you don’t live in one of those cities, drop them a note on Facebook telling them where you live and how much you’d like to see their products where you live! Disclaimer: TidyMom is working in partnership with Lia Marie’s to spread the word about this garlic spread that’s sweeping the nation. All options and love for Lia Marie’s are all my own. Looks good! What part of the grocery store did you find it in? This looks magical! Anything with lots of garlic has got to be good. That chicken sounds fantastic! What a great way to punch up weeknight meals. I can’t wait to try that spread…what a great idea and a delicious meal idea! Bummer I can’t get it here! I love easy and I love garlic! Sounds delicious to me. And, easy is perfect for busy school nights, so I cannot wait to try it. And, can I just say…I think that your husband is awesome, and I love it when you include him in your posts because I can just tell how much you adore each other. So sweet! looks like a winner for the kids too!! Garlic makes the world a better place 🙂 I can’t wait to give this chicken a try, once I find the garlic butter. 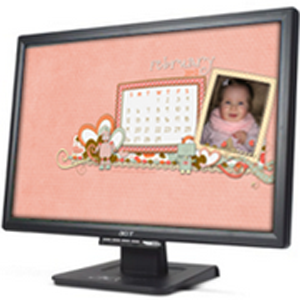 Perfect and quick for any busy person. I loooove garlic! this looks delicious! This butter sounds delicious! I am going to have to be on the look out for it! I love the sound of that chicken! We eat chicken 85% of the time at my house and DS has been known to eat my garlic cloves in passing ;D I am definitely trying this, it looks delish! That chicken sounds awesome – I love my chicken all garlicky!! Tasty! And so easy to do, too. Garlic is such a magical ingredient, isn’t it?! Whenever there is a recipe that finds a new or easy way of integrating garlic, I’m on board. I bet this spread would also be really delicious if it were spread on and then baked into crescent rolls; mmm, my mouth is watering just thinking about it! And thank you so much for including the link for a coupon. Saving money is always a plus. I must say we love the Lia Marie spreads. I finished my shopping at my usual Pick ‘n Save in Wisconsin and was told that “Lia Marie has been discontinued and is no longer available. Is this possible? Omg!!!! This recipe is my absolute favorite!!! Genius!!! I made these for dinner tonight an they were perfect, thank you for the great recipe! I didn’t have the Lia Marie garlic spread so I just mixed together some butter and minced garlic. It worked out great. My kids absolutely loved them too.